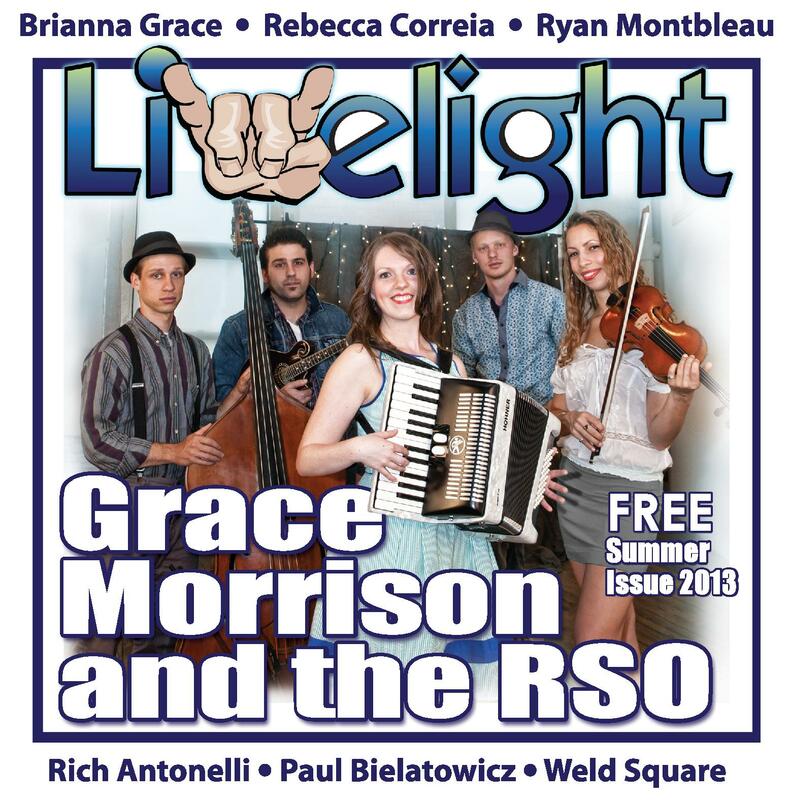 On June 8th, Grace Morrison and the RSO shared the 30-65 Live stage in East Wareham, Mass., with seven other finalists for Limelight Magazine’s “We Got You Covered” concert. All the members of the indie-folk quintet – violin player and vocalist Marta Rymer, percussionist Nate Tucker, upright bass player Max Judelson, Benjamin Moniz on guitar, mandolin, banjo, and vocals, and Grace Morrison on lead vocals, acoustic guitar, and accordion – performed with a raw heart and soul that ended up winning them the first prize. On stage, everything from their look, to their presence, to the command of their instruments set Grace Morrison and the RSO apart as a unique local band. The RSO are definitely a bit different, but they masterfully command their difference. They performed three original songs and one cover to a room full of nearly 100 members of the local community. Getting huge applause at the end of their set, it was clear they were one of the bands to beat that night, yet Morrison said she was surprised when they were announced as the winners. Their sound is crisp and grassroots folk that resonates and sets the tone in any room. The effect is instant and people clap and children dance to their songs. Everything from the music to Morrison’s enthusiasm on stage is enough to make members of the audience want to smile and join the children in dancing. It comes as no surprise that the five musicians began learning music at a young age with classical training. Morrison’s study of music began with piano at age five and she eventually taught herself guitar. She also took classical vocal training. The rest of the members of the RSO are classically trained in their respective instruments, as well. The band may be more rooted in the traditional sense with their instruments and their songs’ subject matter, but they have plenty of modern flair that breathes new life into their Renaissance inspired music. In 2010, their shared love for history of the Renaissance brought a few of them together at King Richard’s Faire in Carver, Mass. Each fall from the beginning of September to the end of October the annual faire draws thousands to a secluded section of the forest. Back from the street and surrounded by trees, “the realm,” as it’s called, exists on its own as an illusion, inviting both fantasy and history to meet. From the music to the costumes the illusion is complete. Morrison and Moniz already knew each other from UMASS Dartmouth and had been playing with each other since around 2005, but they had yet to find the rest of their band. At the time, Morrison was working at the fair and met Rymer, who also worked there as a performer. Through Rymer, Morrison and Moniz met Tucker and Judelson. In the fall of 2012, Grace Morrison and the RSO released their self-titled debut album, recorded at a local studio in Westport, Mass. Currently, Morrison said the band is saving money to record a second album and have songs already written for it. Songs on their first CD move throughout history from Henry the VIII and his wife to the Titanic and WWII, Morrison said. “I’ve always been inspired by history, especially with working at the Renaissance fair,” she said. Through her music, Morrison aims to create a bridge between the past and present by writing about historical figures and events. She hopes her songs will make people realize a connection between the emotions people had in the past and those people have in the present. In her opinion, there hasn’t been much of a change and she aims to shed light on that. “We’ve always tried to stay away from vapid love song material,” Morrison said. Their cover rendition of “Purple Haze” has garnered the band quite a bit of attention – this year at The Middle East Nightclub in Cambridge, Mass., and last year at the Barnstable County Fair’s Battle of the Bands where they met their current manager. On June 8th, they also chose to close their set by playing a strong folk rendition of it. This summer Grace Morrison and the RSO have a full schedule of shows in Massachusetts from festivals to more intimate venues including Arts Alive Festival in Falmouth, Onset Summer Of Love, and New Bedford Folk Festival. This will be their second year playing the New Bedford Folk Festival and the band’s first time playing Onset Summer Of Love together on June 26. For more info about the band, visit http://www.graceandtherso.com.